Let's get the weird stuff out of the way right at the start. The new Guitar Hero: Warriors of Rock, has an actual story, which Gene Simmons narrates as the God of Rock. Rush's epic 2112, complete with full liner-note narration by the band, is part of the test players have to pass to gain access to the God's magic guitar and battle against the Beast who imprisoned the God of Rock. Dave Mustaine recorded new songs for the final fight. Also, Axel Steel can now turn into a mummy. In short, the new game should have players swimming in a sea of anticipation and confusion. Guitar Hero: Warriors of Rock moves away from the shred-tastic tone of previous games in the series in favor of a stronger rock focus, a focus untarnished by the series' previous concessions to the soft rock world. So, goodbye, Elton John; hello, Megadeth. Familiar characters like Johnny Napalm and Judy Nails return, but this time they're not just concerned with finding fans and maintaining multipliers. Now each of the series' rockers takes part in a story-based fantasy quest, complete with super powers, mythic bands and hard-rocking musical challenges that are woven into the context of the story. The Escapist recently had the chance to see the game firsthand in San Francisco and to talk with Megadeth guitarist and vocalist Dave Mustaine about his contributions. For a musician who has an entire Wikipedia page devoted to his feuds and rivalries, he is a surprisingly friendly and mellow interview subject, able to speak with sincere enthusiasm about being asked to write the final three songs in the game's story. "We landed the big kill there," says Mustaine. "That was a twenty point buck. We got the last three songs of the whole game. Could you ask for more? Have these guys call up and say, 'Hey, we want you to do a song and do what you want. Oh yeah, and by the way, have fun.' What do you mean have fun? Every time we do a song for hire, it's like having somebody slowly - never mind. That was a painful analogy, so I'm not going to say anything. It was just so fun." 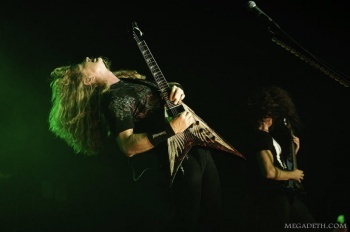 In creating the solos for the new game, the developers obviously wanted Mustaine to have as much freedom as he wanted, but that didn't mean he wasn't interested in learning from the developers how best to adapt his approach to the videogame. "I'm a guitar player," he explains, "Not a Guitar Hero player." Perhaps the most surprising and encouraging feedback he got was to do even more of what he was already doing. "It's a typical balls to the wall Megadeth song and it works but the funniest thing was that when we turned it in, they go, 'Man, we want more solos on it.' I was like 'Really? I can do that.'"